SouthWest Water Company (SWWC) has been named a recipient of the Plant Excellence Award for 2016 by the Alabama Water Environment Association (AWEA). SouthWest Water Company is pleased to be the presenting sponsor for the 2017 Birdies for Charity event, as a part of Regions Tradition (May 17-21) at Greystone Country Club. 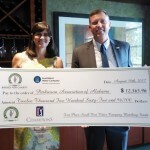 Birdies for Charity has raised nearly $1.5 million for area non-profit organizations. The cost of creating this website was borne entirely by SouthWest Water Company, and is not the basis of any portion of any rate adjustment. Visit the Alabama Clean Water Partnership for more information on cooperative water solutions.